Aleida Guevara: Actually, I don’t really like having to deal with this sort of question about my father, who is not with us anymore. It’s difficult for me to speak for him or say what he would be doing. But judging by the speeches he made, by his personal notes and letters, I can say that he always cared a lot for his people and for the poor in particular. And I am convinced that he would be deeply concerned over what is happening in the Arab world now. He would definitely be thinking of ways to help. He was always respectful of people. And though he criticized socialism quite heavily, he had a lot of respect for the Soviet people, too. That’s why I believe he would have been deeply frustrated over what is going on between Russia and Ukraine – after all, these people have lived in harmony for so many years… That’s why all of this aggression looks so unnatural to us. So yes, I think my father would take a keen interest. RT: In one of your interviews with RT you said that if Ernesto Che Guevara were alive, he would be supporting Hugo Chavez in every possible way. Unfortunately, Chavez passed away some time ago. 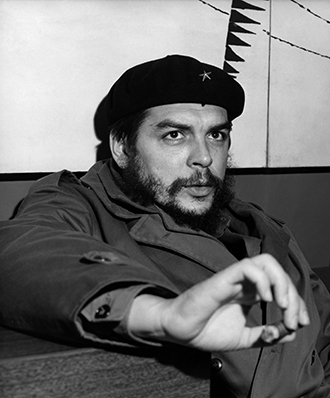 So who would Che Guevara be backing today, and in what ways? AG: He would be backing all the revolutionary movements, I guess. He was a great revolutionary himself, and he would be helping all the men and women who are trying to change their lives. I have close connections to the landless workers’ movement in Brazil, who are fighting for access to land in order to make a living. In spite of the difficulties that the movement has faced for more than 25 years, they’ve been able to make huge progress across the continent and in Brazil in particular. And frankly speaking, I do believe that this movement does encourage Latin America to move ahead. But decisions made by Evo Morales, Nicolas Maduro and Rafael Correa are also important. My father always appreciated staunch advocates of a certain ideology who know exactly what they want in life. No matter if he agreed or disagreed with them, he would certainly give a hand to those leaders who are willing to change their peoples’ lives for the better. RT: The West sees Cuba as a dictatorship. What would you say to that? AG: They have no idea what a dictatorship is. No dictator would educate his people, because the more educated the people, the freer they are. No dictator would introduce free education for everyone. All this time our government has been working on raising cultural standards. Such initiatives are at odds with the features of a dictatorship. The more people think about the world they are living in, the freer they become. They have more choice and they can understand exactly what they want. So we’re talking about an approach that is totally uncharacteristic of a dictatorship. What kind of a dictator wants his people to be healthy and have free education? What kind of a dictator would take steps to teach his people solidarity with other nations? What kind of a dictator would send sports coaches to help out in other countries? You can’t even mention those things in the same breath. But this is what’s happening in Cuba. Solidarity, respect, love for other peoples and self-sacrifice for the good of others are the principles which are Cubans taught. How can you associate that with a dictatorship? I think it’s impossible, and I can’t understand that. RT: The majority of the UN member states once again condemned the US embargo on Cuba. However, some believe that there are people in the US who are interested in lifting the embargo in order to infiltrate Cuba and put an end to the Cuban Revolution. Is Cuba ready for the possibility of the embargo being lifted? Do you have any concerns about that? AG: None. If the embargo was lifted today, Cuban economy would be thriving tomorrow. And if our everyday life improved, if there was affordable housing, then our public transport, diet and entertainment industry would take a turn for the better as well. More things and services would become available to our people. A time of prosperity would begin for our country. I’ll give you an example so that you understand what the embargo really means. The USSR sold and gave us a great number of trucks back in the day. But the USSR has always been an oil-rich country, so your trucks and cars were manufactured with no particular concern over fuel efficiency. We still use those Soviet trucks in Cuba, but we don’t have the oil that the USSR used to supply. We simply don’t have it anymore, so we had to try and find more fuel-efficient engines. We decided to go to Italy, a country with large-scale car production. As you can imagine, we never got to purchase a single engine from Ferrari. That was the end of this story. That’s the kind of blockade I am talking about – it affects the entire Cuban economy. It’s like an older boy trying to take a toy away from his baby brother. I’d go as far as to call it cruel, because the embargo affects even food and medicines. We have children with complicated pathologies in Cuba. The medication that they require is patented in the US, so no company is allowed to sell it to us. We do have the money to buy it, and we are in no way asking for it for free. Yet, as a part of this economic embargo the US prohibits companies from selling this medication to Cuba. And if they do they would face a 5 to 10 mln-dollar fine, or would be banned from selling their products in the US. Consequently, we cannot just buy it. Sometimes we have to go through five or six different intermediaries to get this medication, as it is one of a kind in the world, and we desperately need it here. The medication is expensive as is; one can imagine how its cost grows as each of these intermediaries tries to make money off it. The medication becomes incredibly pricy for Cubans. If the economic blockade is lifted we would be able to buy it at its market price, which would mean saving the costs for people significantly. So this gives you an idea of what Cuba would become like if the embargo was lifted. The island’s economy would flourish immediately. And in view of our social benefits advantage, the situation would get even better. So my question is, how could lifting the embargo harm us? The US has already undertaken aggressive action against Cuba. Among other things, they were trying to buy Cubans to get them to help the US subvert our government. Some people who were involved in this posed as opponents of the Cuban Revolution, while being our double agents working to protect our nation against this kind of aggression. The US has been trying to attack our youngsters as well. So we introduced Cuban teachers as double agents who were also trying to counter these hostile activities. We do have this kind of experience as well. RT: Thank you so much for taking time to answer our questions.